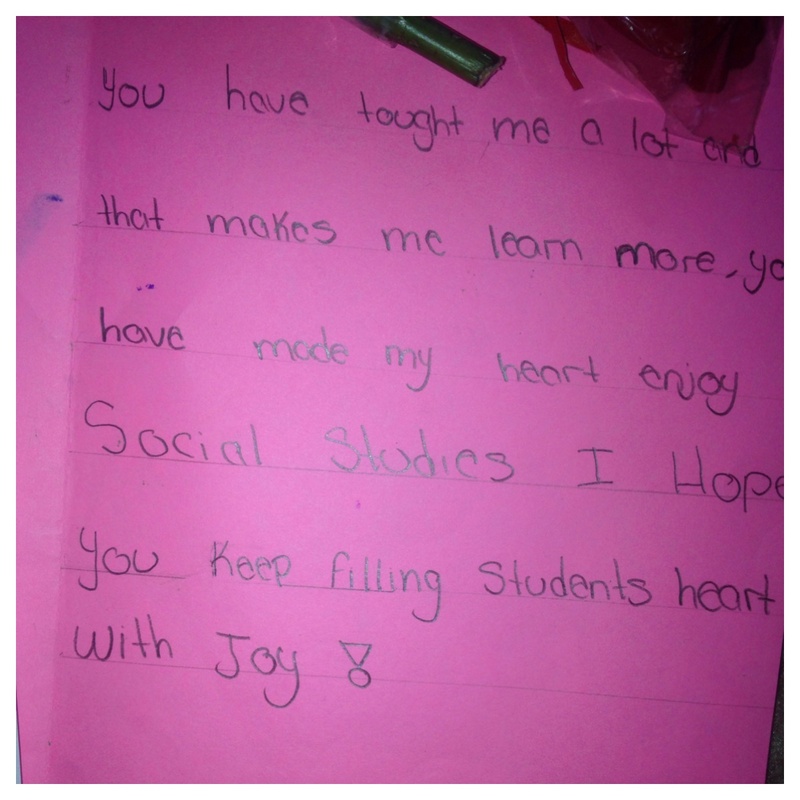 I have never blogged about my students or my experience with teaching but, here goes. Valentine’s Day in middle school is a sight to see. Life-size teddy bears. Chocolates. Hearts broken over gifts they didn’t receive. When students arrived yesterday, they were eating chocolate for breakfast and exchanging Valentines at the door so it was clear to me that my planned lesson was obviously out. And based on the way that the semester has been going, I realized I needed to do something very different. Instead of our regularly planned lesson, I decided to spend the day giving what I called “Verbal Valentines.” I went student-by-student and shared reasons why I love and appreciate them. After what I have seen this school year, many of the students are truly unaware that anyone loves or cares for them. 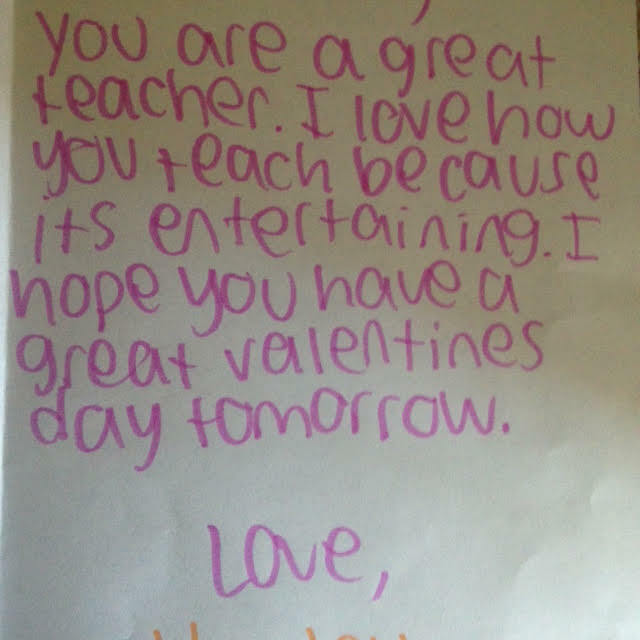 Just yesterday, I had a boy break down crying right in front of me because he “never gets anything for Valentine’s day.” This student’s eyes held real pain. Pain that obviously stems from more than a lack of chocolates. This isn’t the only time I have seen this. I have students who act and who seek attention in all the wrong ways. To me, it is obviously a cry for help. At 11 or 12 years old, they do not know how to say “I am hurting because my dad left us or because my mom doesn’t come home at night. Please help me. I need a hug. I need someone to acknowledge my presence.” The only way they know how to get attention is to act out. And with the murder of a Clark Atlanta University student over an iPhone 6, the murders of 3 North Carolina college and grad students (which may be a hate crime) and the murder of a Las Vegas mom that was caused by road rage all in the past week, it is obvious that love is something that we could use more of. One of the most touching Verbal Valentines I received was from a student I have a couple times a day who has a very old soul but does not have the best manners. I have had to correct several times for cutting me off, for blurting out at inappropriate times, for saying hurtful things to other students, etc. To be honest, he was the last student that I thought would have something nice to say. It’s not that I am mean to him, but it’s that usually 6th graders aren’t big fans of correction. What he said, however, has impacted me more than a lot of the compliments that adults have given me. He told me that he appreciates me because I don’t just teach content, but I also teach him life skills and manners. He said that before he came to 6th grade, he used to say a lot of things to his parents that were rude and mean. Since he’s been in my class, I have corrected him and taught him manners and now he is much nicer to his parents and everyone. He even told me that I am one of his absolute favorite teachers. To hear that from this particular students blows me away because I correct him often, but to know that correcting my student with love is actually benefiting him and that he knows that blessed me in a way that I can’t even explain. Teaching is heavy work. It is time-consuming, emotionally-taxing, exciting, fulfilling, frustrating and overwhelming all at once. I have worked many jobs and none of them have made me feel like this one has. This school year, I have seen the toll that this job takes on people. Not just myself, but those co-workers closest to me. I have seen teachers cry (self-included). I have seen the look of frustration from situations that don’t change. I have seen the agony that comes from demands that never end even when your time to get them done is taken away. I have seen people question whether this is really for them. But, I have also seen teachers laugh when a student does something hilarious. I’ve seen the moment when a student finally gets it and the smile it brings to a teacher’s face. I’ve seen teachers have each others backs when it matters most. I’ve seen the good and the bad, and what I’ve come to realize is that the key to this is love. Love is what sustains us all. It is what makes us push through the hard days. Love is what makes us pick up the phone to call a parent and tell them what their child is doing. It is what makes us say “come have a chat with me” to tell the child right from wrong. It is what makes us stand up for our students who are not being treated fairly in a situation. It is what makes us get up early to tutor students who need extra help. It is what makes us spend our own money on cookies, fruit, new books or whatever will motivate our kids. It is what makes us act silly just to see them laugh. Love is what works. Love is what changes us. This school year, I have not done everything right. I have let students see me bothered, I have let situations that I can’t change get me upset and I have overexerted myself when I should have gone home to rest. This first year has been a bumpy one, but the most important lesson that I have learned thus far is that loving my students will cause them to change for the better far more than anything else I can do. My love, shown by always doing what is best for their whole self, is what will make the biggest difference in their life. This is what I believed prior to beginning my career in education and with 6 months of teaching under my belt, I realize that this is indeed true. And it is not just about my students but also my co-workers and everyone else I come in contact with as well. People need compassion because life is not easy for everyone. And all of us will at some point go through something where we’ll need the compassion of others. With every little hug, “I love you, Ms. Boulware,” hand-made or store bought card, piece of candy, flower, Verbal Valentine and sweet gesture, my confidence in the fact that I am doing the right thing was re-built. I am confident that I am doing the right work in the right place at the right time, and I have the right One willing to lead me everyday if I am willing to let Him. My prayer for this season of life is that I let Him lead me to love more everyday than I did the day before. Thanks so much for reading and if you know a teacher, share this with them. Hopefully, it will be a source of encouragement. Next PostNext To my love.